Traces of pesticides were found in the blood and urine of 100% of the 9,262 subjects of a 2004 study done by the US Centre for Disease Control. On average, subjects showed 13 different pesticides. The so-called “body burden”, or amount of chemical that remains in the body as a result of exposure, far exceeded the thresholds established as acceptable on two of the common pesticides. Adult women, including those of child-bearing age, have the highest measured body burden levels for half of the pesticides in a class known as organochlorines. Many pesticides in this class can cross the placenta and cause harm during fetal development, including reduced infant birth weight and disruption of neurological development during infancy, potentially leading to learning disabilities and other neurobehavioural problems. Children are especially vulnerable to pesticides due to their high consumption of food, water and air compared to their body weights, their proximity to and time spent playing in grass, and their low ratio of body mass to skin surface area. Bio-accumulative pesticides persist in the environment partly because they are stored in fatty tissue and recycle in the food chain. The Ontario College of Family Physicians study released a study in April, 2004 on the chronic effects of pesticide exposure in the home, garden and workplace. After reviewing 12,000 international studies conducted between 1990 and 2003, the college found “consistent evidence of the health risks to patients with exposure to pesticides,” citing brain cancer, prostate cancer, kidney cancer, pancreatic cancer and leukemia among other acute illnesses. They found no evidence to support the notion that some pesticides are less dangerous than others, saying different types simply have different effects on health. Little or no research has been done on the long-term effects of exposure, or on exposure to combinations of pesticides, as opposed to single substance exposures in a controlled lab. Our bodies are carrying the burden that should be shouldered by the industries that created them and government needs to regulate that. The only way we can currently avoid or reduce ingesting pesticides through food is to eat organic. 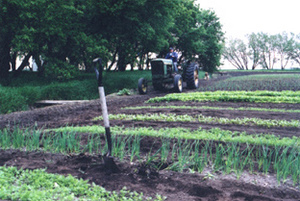 Organic agriculture restores depleted soil health. More than just what they don’t put on their land, organic farmers contribute plant matter, compost and manure to the soil, which encourages microbiotic life and increased nutrient population. In organic systems soil bacteria, mycelium and microbes are encouraged to form communities that break down the straw, compost and minerals in the soil in order to make a broad spectrum of nutrients available to plants, animals and eventually ourselves. Healthier soils provide a medium for plants that are more resistant to pest and disease and the positive cycle begins. Over 3 billion tons of topsoil are lost annually due to non-organic farming methods in Canada and the US while organic agriculture prevents erosion. Pesticide contamination from run-off in groundwater has affected the drinking water supply in most states and provinces. Three reasons why Manitoban lakes and rivers are contaminated are overuse of agricultural fertilizers and pest/herbicides, sludge from factory hog barns, and human sewage. Industrial farming uses more oil than any other industry. 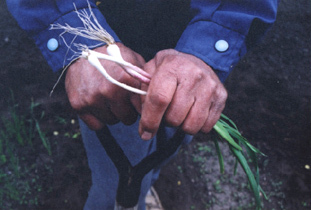 By comparison, organic farming relies on labour-intensive practices such as hand-weeding. No long term testing has been done on the relatively new practice of gene manipulation in plants. Our generation and our environment are the living lab rats and test plots. 12% of Canada’s agricultural landmass is currently growing GM crops. Yet 87% of the international market will not purchase Canadian wheat if it becomes contaminated with genetically modified seed. Canadian farmers can no longer grow non-GMO canola crops due to widespread and irrevocable contamination with Monsanto’s Round-Up Ready canola. The biotech giant now has an application in to get legislation passed that will allow them to unleash their Round-up Ready wheat on the Canadian market. Once this seed is released there is no way to suppress it in nature, Monsanto will also legally control farmers who sign contracts with them demanding they also purchase their herbicides (and even organic farmers and those who choose non-GMO seed but experience “volunteer” plants), such as the high profile case of Saskatchewan farmer Percy Schmeiser who was sued by Monsanto. By eliminating non-GMO canola and wheat for export, Canada is reducing the potential market for our crops since Europe and Japan are refusing to purchase genetically modified foods due to consumer demand. Surprisingly, neither US nor Canadian regulators have imposed any labelling requirements so the public has little knowledge of what is going on. The vast majority of these seeds are being developed by chemical companies, including Dow, Novartis, Dupont and, the market leader in genetically engineered seeds, Monsanto. While these companies claim that genetic engineering is necessary for the world’s food supply to keep up with population growth, their detractors say that their primary motivation is to increase sales of pesticides that these same firms produce. For now, the only reliable way of avoiding genetically engineered foods and to make a stand for Canadian market demand for non-GM is to buy organic. This is because organic food certification agencies forbid the use of genetically modified seeds. There were almost a million less farms at the beginning of this century than the beginning of the last one. Large corporations with economy of sale, and with government subsidies, are forcing the small folks off the farm. The average age of a Canadian farmer is 56. Rural communities are withering and losing their youth and businesses that support the community and their vitality. Organic farming with its more labour intensive methods and principals based on stewardship of the land inspire smaller farms to continue producing with long-term sustainability taken into account. What does Fresh Option do to support Organics? The foods we buy and sell are certified organic wherever possible. If we sell a product that is not certified organic, it will be indicated as such. The only reason a non-certified product may be chosen is when a certified counterpart is not available, or on a case to case basis, if there is a locally-grown chemical-free option from a farm that is transitional or has been using organic practices. We consider each purchase on an individual basis, and sometimes it makes more sense to buy non-certified but organically-grown local lettuce from a nearby farmer than to bring certified lettuce in from over a thousand miles away. You can be confident that what you are putting into your body is good for you and for the environment and has been chosen responsibly. 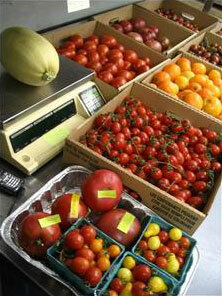 We are increasing the market and demand for organic food in Winnipeg. By providing high quality fresh foods, committed customer service, education and convenient delivery, FOOD encourages the growth of the organic movement. The grassroots support for local organics has allowed us to bring on many more producers as we grow, and to provide a market for our committed local organic farmers encouraging them to turn more of their land over from conventional to organic. We work at building the organic community by being co-operative and active members within it. We are actively involved with OFCM (Organic Food Council of Manitoba, a chapter of Canadian Organic Growers), an organization whose purpose is to educate and promote organic agriculture in our province. Fresh Option provides sponsorship for local organic events, including The Annual OFCM/WSO Organic Gala (fundraiser), and an Organic Farm Tour. We compost our organic waste. We help connect our producers to one another to share ideas, offer support and trade advice. We donate food to community groups that make efforts to bring awareness of organic food to a wide diversity of Winnipegers.